Following our conscience can get tricky, especially in relation to others. Sometimes God calls us to “recalibrate” our conscience in order to encourage believers. A Christian man I know came out of a rough and sinful “bar scene.” As a new believer, he showed spiritual growth in many areas, but he still struggled with some tough memories. A certain kind of music reminded him of those sinful days and opened him up to temptation. Because fellow believers loved that man in Christ, they chose, in his presence, not to play the kind of music that wounded his spirit. His friends showed great maturity, sensitivity and deference. Sometimes a “weak conscience” stems from a believer’s past experiences with legalism or a different religious culture. Other times—like the Christian who came out of the “bar scene”—a weak conscience comes from struggles with long-standing temptation or memories from their years before coming to know Christ. Andy Naselli writes about Christians’ need to “recalibrate” when it’s clear something isn’t necessarily taboo for them but it is a “stumbling block” to others following Christ. We wisely need to be more proactive about clearing our conscience in those cases, but the first step is to recognize when we have offended or hindered someone. We often recalibrate spiritually as God changes our perspective. We choose to follow the direction and Lordship of Jesus in matters of conscience (Mark 7:18–19; Rom. 14:17; 1 Cor. 8:8), even when it doesn’t make sense to us. We see an example of this when Peter, in a vision from God, revolted against eating forbidden animals, but then he recalibrated his conscience (Acts 10:9–16) after a voice from heaven said to him, “What God has made clean, do not call common.” Perhaps in that vision Peter understood a connection to gospel outreach. He, like the other disciples, initially struggled with Jesus reaching out to the Gentiles (John 4:1–42; Matt. 15:22–30). But over time, observing the Master, the disciples and ultimately the Body of Christ recalibrated their thinking. They began to understand the Savior’s mission and their assignment (Mark 16:15): The gospel message was for Jews, Gentiles and “everyone who believes” (Rom. 1:16). In recent days, I’ve examined my conscience to see where it might not be in line with Scripture. When faced with a choice of conscience, I try to ask three questions. 1. Is there some shred of doubt? Romans 14:23, addressing the issue of eating “forbidden” foods, notes: “Whatever does not proceed from faith is sin.” In the broader sense, whatever choice in my walk with God is not agreeable to the Scriptures—the Word and doctrine of faith—should not to be pursued. Without faith, I cannot please God (Heb. 11:6). As I walk in faith, I must be aware that sometimes another Christian’s walk may look entirely different from mine. God may give them different marching orders. This is the “Others May, You Cannot” concept. Be careful in matters of the conscience not to disdain what God has allowed for others. Give grace! At the same time, to ignore or disobey the Holy Spirit’s caution or direction to us is to sin against Him and our conscience. 2. Is there some way my choice might damage others? Paul addressed the question of certain things being lawful for believers. But what if they are not the most helpful or edifying choice? Something might be lawful for me, but will my choice wound another Christian’s soul? I want to be careful not to hinder another believer’s walk with God (Rom. 14:13, 21; 1 Cor. 8:12–13; 10:32). I don’t want my choices, even if I am free to make them, to become a “stumbling block” to a weaker believer, hurting their conscience and possibly hindering them from fully following Christ. 3. Is my choice somehow defiled by sinful desires? In other words, does my choice line up with the perfect and holy Word of God? Is my conscience clean and clear by God’s standards? The Bible speaks of unbelievers who profess to know God, but by their deeds they deny Him. Their internal radar is “corrupted” or defiled (Titus 1:15–16). Some even have a conscience so defiled the Bible describes it as “seared” or rendered insensitive to sin, not working properly (1 Tim. 4:1–2). At one point in my Christian journey, when my conscience was terribly weak and I desperately needed to stop justifying my sin and realign my conscience with the Word of God, I decided I wanted to have a conscience void of offense toward God and others. God called me deeper into His Word. He slowly showed me sins that weakened and corrupted my conscience and hindered my prayers and ministry. A conscience “void of offence” means knowing there is no unconfessed sin between God and us, and that “we can look everyone we know in the eyes without shame and know that we are right with them, insofar as it depends on us” (Seeking Him). Jesus takes personally what we do or say to others (Matt. 25:37–40, 45). It is our needful duty to realign our conscience with His Word and continue to speak God’s Truth into our lives. It is also our responsibility to stay sensitive to the Spirit and do whatever is required to gain a clear conscience with others (Matt. 5:23–24). Pray daily for a strong conscience. Jiminy Cricket didn’t go far enough. 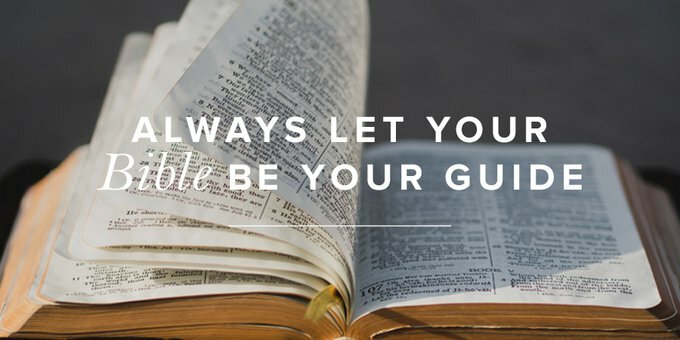 Letting our conscience be our guide is only good advice when our hearts are saturated with Scripture and we walk in step with the Spirit of God. Previous Post Caring for Aging Parents, Selfless Listening, and More . . .